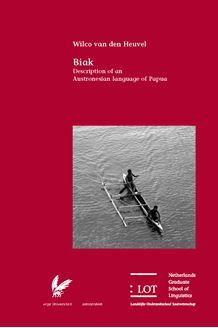 This work contains the first comprehensive description of the Biak language, an Austronesian language spoken by approximately 70,000 speakers on the island Biak and in several settlements along the northern coast and off-shore islands of the Bird's Head peninsula of Papua, Eastern Indonesia. The description focuses on the language as spoken in the village Wardo, but also contains data from other villages in the area. The study is mainly based on primary data gathered by the author during fieldwork on Biak. It is not placed within an all-encompassing theoretical framework, although insights from various linguistic theories are used to support the analysis. The Biak language is part of the South Halmahera West New Guinea subgroup of the Austronesian family, of which only a handful have been described in any detail. Given the close historical relation between this group and the Oceanic languages, the present book contains valuable data for a closer understanding of these languages. In the area around the island Biak we find a mixture of Austronesian and non-Austronesian (Papuan) languages. Due to the traditionally prominent role of Biak people in trade, the language has been in contact with many languages in the area. The present work, then, is of interest not only to scholars of Oceanic languages or Austronesian languages in general, but also to scholars of Papuan languages, scholars of language contact, and those interested in the typology of language as such.